(Nanowerk News) A new device developed by Stanford University researchers could make it easier for doctors to monitor the success of blood vessel surgery. 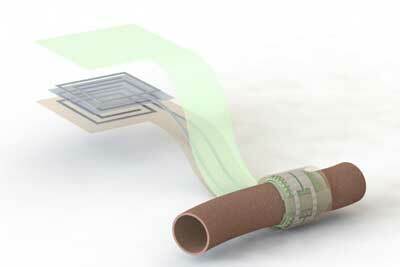 The sensor, detailed in a paper published in Nature Biomedical Engineering ("Biodegradable and flexible arterial-pulse sensor for the wireless monitoring of blood flow"), monitors the flow of blood through an artery. It is biodegradable, battery-free and wireless, so it is compact and doesn't need to be removed and it can warn a patient's doctor if there is a blockage. "Measurement of blood flow is critical in many medical specialties, so a wireless biodegradable sensor could impact multiple fields including vascular, transplant, reconstructive and cardiac surgery," said Paige Fox, assistant professor of surgery and co-senior author of the paper. "As we attempt to care for patients throughout the Bay Area, Central Valley, California and beyond, this is a technology that will allow us to extend our care without requiring face-to-face visits or tests." The sensor wraps snugly around the healing vessel, where blood pulsing past pushes on its inner surface. As the shape of that surface changes, it alters the sensor's capacity to store electric charge, which doctors can detect remotely from a device located near the skin but outside the body. That device solicits a reading by pinging the antenna of the sensor, similar to an ID card scanner. In the future, this device could come in the form of a stick-on patch or be integrated into other technology, like a wearable device or smartphone. "This one has a history," said Bao, the K. K. Lee Professor in the School of Engineering and co-senior author of the paper. "We were always interested in how we can utilize these kinds of sensors in medical applications but it took a while to find the right fit." The researchers had to modify their existing sensor's materials to make it sensitive to pulsing blood but rigid enough to hold its shape. They also had to move the antenna to a location where it would be secure, not affected by the pulsation, and re-design the capacitor so it could be placed around an artery. "It was a very exacting project and required many rounds of experiments and redesign," said Levent Beker, co-lead author of the paper and a postdoctoral scholar in the Bao lab. "I've always been interested in medical and implant applications and this could open up a lot of opportunities for monitoring or telemedicine for many surgical operations." The idea of an artery sensor began to take shape when former postdoctoral fellow Clementine Boutry of the Bao lab reached out to Ana?s Legrand, who was a postdoctoral fellow in the Fox lab, and connected those groups - along with the lab of James Chang, the Johnson and Johnson Professor of Surgery. "We both value our postdoctoral researchers but did not anticipate the true value this meeting would have for a long-term productive partnership," said Fox. "Using sensors to allow a patient to discover problems early on is becoming a trend for precision health," Bao said. "It will require people from engineering, from medical school and data people to really work together, and the problems they can address are very exciting."